San Diego’s Brazilian Jiu Jitsu School | Best BJJ Classes & Training in San Diego! Welcome to our San Diego Jiu Jitsu school. With over 50 weekly adult Brazilian Jiu Jitsu (BJJ) classes, we’re the largest individual Jiu Jitsu academy in San Diego, as well as the rest of the U.S. Our gym emphasizes strong BJJ Fundamentals for beginners, a heavy emphasis on intermediate and advanced instruction, and high-level Competition training for all belts who wish to compete. This world class Jiu Jitsu program, included with all of our other programs, is only $99 monthly. This is the best value in North America for this caliber of training. Our Head Jiu Jitsu coach is the legendary Baret Yoshida. Master Baret is a 3x IBJJF Black Belt World Champion, 3x ADCC medalist, and known worldwide as one of the top 3 American Pioneers in Jiu Jitsu. He personally teaches 26 BJJ classes at The Arena, offering a phenomenal opportunity to be personally tutored by one of the best Jiu Jitsu coaches on the planet. Under his leadership, our Jiu Jitsu school offers world class training for all belt ranks, including professional competitors. With over 50 weekly adult Jiu Jitsu classes at our San Diego headquarters, we’re the single largest adult Jiu Jitsu school in the U.S. in one location. We offer numerous Fundamental classes throughout the weekday, so our white belt students learn how to build a strong foundation to base their future development on. We also offer a large amount of intermediate / advanced classes taught directly by Master Baret Yoshida. These San Diego BJJ classes are based on a specific curriculum and continually build on each other. Utilizing constantly evolving techniques that are competition tested, we advance our students towards receiving the coveted Black Belt under Master Baret. Under Master Baret’s leadership, we have developed an outstanding Competition Team. As one of the best Jiu Jitsu teams in San Diego, we have a strong focus on competition training and hold 4 IBJJF training camps every year, as well as mini-camps for local tournaments. We regularly win Adult Team Title (we don’t offer children’s Jiu Jitsu training) at every local tournament we enter. Many of our competitors place in the top 3 in the IBJJF Pan American and World Championships in both Gi and No Gi Jiu Jitsu, as well as in a variety of other San Diego, National and International tournaments. Our Head Jiu Jitsu Coach is Master Baret Yoshida. 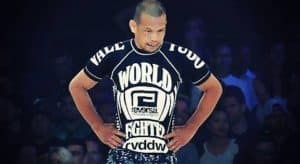 Baret is a 3x IBJJF Black Belt World Champion, 3x ADCC Medalist and the only man in history to compete in the ADCC 10 times. To say he’s a legend is an understatement. Master Baret personally teaches 26 Jiu Jitsu classes a week at The Arena and rolls in every single class. We also have 4 other outstanding Brazilian Jiu Jitsu Coaches who teach according to the Baret Submissions method. These instructors train under Master Baret daily, so all our students receive cohesive coaching throughout our program. Under Master Baret Yoshida’s leadership, The Arena is proud to offer Sixth Sense, our unique sports and self-defense training program for the blind. We provide this free program to this historically under-served community as a way of giving back. If you would like more specific details, please contact us. Come to the Arena. It’s great instruction. All the classes you want to take. It gives me a great opportunity for training with a high class, highly professional, highly athletic group of instructors and also their students. Their structured fundamentals to advanced Jiu Jitsu classes are great. Everybody is really cool. Baret’s awesome. Down to earth. They’ll give you pointers before, after and during class. It’s easy to go to one another to get a few tips on the lesson of the day. Or even to provide any tips outside the gym. Baret’s one of the most dedicated people I’ve ever met. And him being such an active competitor sets a good example for all the students here. Also, him just teaching so many classes here. He’s always here and a lot of schools just don’t have that type of instruction. In a lot of Jiu Jitsu schools, the head instructor is only there sometimes or he’s on his phone the whole time. Baret doesn’t mess around with that, man. He’s always teaching. It’s such a good vibe. I encourage everybody to come out here and train with us. Ready to take it to the next level? Want to compete for one of the best teams in Jiu Jitsu? Then become part of Team Arena. Preparing athletes for competition is the backbone of The Arena and one of the primary reasons why we do what we do here. All you need to do to start on the path to compete for us in Jiu Jitsu s to complete our “Ready to Compete for The Arena” form. Whether you’re just beginning in Jiu Jitsu, or you already have Amateur or Professional experience, we have you covered. If you’re a Beginner, we’ll make you a skilled Novice. If you’re an experienced Novice, we’ll take you to the top of the Amateur ranks. If you’re a high level Amateur, we can get on the road to a solid Pro career. And if you’re a talented Pro who’s willing to put body, heart, mind and soul into it, we can bring you to a World Class level.